I am hard at work in my studio working on some fun cards for next month already. But this month I have have been focusing on My Favorite Things Stamps and this is one more of their fabulous stamps. 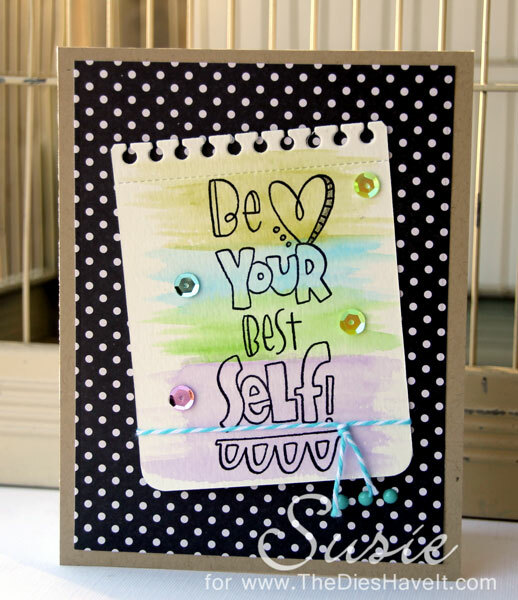 This image is part of the Be Your Best Self stamp set. I just love the different ways this set can be used. Lately I've been enjoying some water coloring brush strokes, but this stamp can also be colored in with markers or just left as a line image. To complete my card I added some sequins in the same colors as my brushstrokes. I hope you like today's card and will take this advice to heart too! Great card! Love MFT stamps!